I literally wrote « Sprintemps » in the title before correcting it to « Springtime ». I think my franglais has gotten a little out of hand. But that isn’t the subject of this post. Or is it…. I wanted to illustrate Paris this Spring; not that it needs doing… for Pete’s sake, every blogger and their brother is posting pretty blossoming photos of Paris these days. But really, it cannot be helped when you live here. 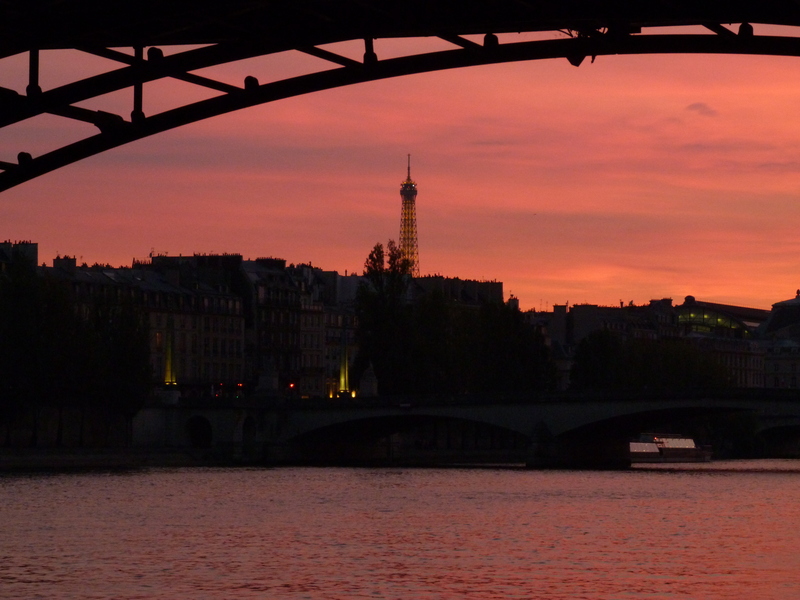 This isn’t to say that living in Paris is all cherry blossoms and pink sunsets…far from it. Paris also includes in the package : tired legs, aching feet, angry fellow metro passengers, (enjoy this funny parody about an « incident » on the metro), pushy people on buses, pushy people everywhere, umbrella wars when in rains, unreliable transportation, interminable lines at any public service office, insurmountable amounts of paperwork in order to get anything done… oh people, I could go on for at least 100 more of these… but that’s not the purpose of this blog post. Or is it…. I hope I give a balanced portrait of Paris on this blog. Perhaps I do tend to blog a little bit more about the beauté of Paris than the annoying parts. I would assume that is because I don’t want to have to always relive them in my free time when I am writing blog posts. But I promise, a blog post is coming up soon about one of the trials and tribulations of living in the city of lights. And so now that the point to this post is lost on me entirely, I will just give you the rest of the delightful pictures I have been taking (and instagraming) lately, which portray Paris in her best light : Spring light! The Square des Batignolles, (pictured just below), a frequent subject on my instagram feed an occasional subject on the blog (even though I seem to blog about it in the Fall for some reason) is one of the treasures of this city in the Spring. The water fowl and bird life is abundant (please don’t feed them according to the signs posted), and it is rather calm in this little green corner of the city. A gold star to who ever can guess where the following picture was taken! (Leave your answer in the comments below). The following image is taken at the Westin Hotel where I blogged about their winter terrace where you can have cocktails and an aperitif. Well, they have dressed it up for Spring now, so head there before 8pm to enjoy a refreshing beverage and the sounds of the trickling fountain. It’s pure peacefulness. I’m a sucker for cobblestone street corners with a bicycle waiting for its owner. The following two photos (with the spears and the leaf)…are where? (Both taken in the same garden) Leave your answer in the comments! Springtime brings people back in flocks to café terraces. This one is waiting as the workers in the surrounding area pour out of the shops and office buildings, vying for the best seats for seeing and catching some of those precious Spring rays of sunshine. The days are much longer now, and we have even started wearing sunglasses again… Spring is so delicious! And the tower she glows on, and on, beautiful in any light that the weather can throw at her. and #2 is jardin des palais royal? I do miss Paris in the spring. I absolutely love how everyone seems to crawl out of their caves they had been hiding out in all winter. The cafes finally put seating outside and people sit along the Seine. It is truly a breath of fresh after a typically long winter (for me at least!). Thank you for your beautiful pictures! Ah! Ce fera de superbes tableaux ma chère Barbara!